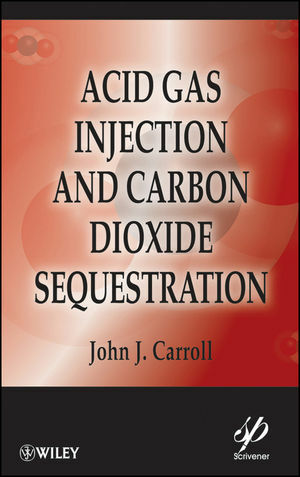 This book provides the most comprehensive and up-to-date coverage of two techniques that are rapidly increasing in importance and usage in the natural gas and petroleum industry — acid gas injection and carbon dioxide sequestration. The author, a well-known and respected authority on both processes, presents the theory of the technology, then discusses practical applications the engineer working in the field can implement. Both hot-button issues in the industry, these processes will help companies in the energy industry "go green," by creating a safer, cleaner environment. These techniques also create a more efficient and profitable process in the plant, cutting waste and making operations more streamlined. John J. Carroll, PhD, PEng is the Director, Geostorage Process Engineering for Gas Liquids Engineering, Ltd. in Calgary, Canada. He joined Gas Liquids Engineering after three years with Honeywell Hi-Spec Solution in London, Canada, and, previous to that, Dr. Carroll was a Research Associate and Lecturer at the University of Alberta in Edmonton, Canada. Dr. Carroll holds bachelor and doctoral degrees in chemical engineering from the University of Alberta, Edmonton, Canada, and is a registered professional engineer in the provinces of Alberta and New Brunswick in Canada. His fist book, Natural Gas Hydrates: A Guide for Engineers, is now in its second edition, and he is the author or co-author of 50 technical publications and about 40 technical presentations. 1.8 Who Uses Acid Gas Injection? Chapter 2: Hydrogen Sulfide and Carbon Dioxide. 2.1 Properties of Carbon Dioxide. 2.2 Properties of Hydrogen Sulfide. 2.3 Estimation Techniques for Physical Properties. 2.4 Properties of Acid Gas Mixtures. Chapter 3 Non-Aqueous Phase Equilibrium. 3.3 Calculation of Phase Equilibrium. Chapter 4 Fluid Phase Equilibria Involving Water. 4.1 Water Content of Hydrocarbon Gas. 4.2 Water Content of Acid Gas. 5.2 Hydrates of Acid Gases. 5.3 Estimation of Hydrate Forming Conditions. 5.4 Mitigation of Hydrate Formation. 6.3 Compressor Design and Operation. 6.6 Compression and Water Knockout. Chapter 7 Dehydration of Acid Gas. Chapter 10 Selection of Disposal Zone. 10.3 Interactions With Acid Gas. Chapter 11 Health, Safety and The Environment.